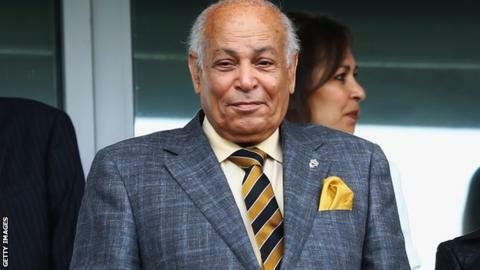 Hull City owner Assem Allam has revealed the club is for sale as he continues to fight for a change of name to Hull Tigers. He threatened to quit the Premier League club within 24 hours if the name change bid failed, and the Football Association turned it down in April. "When I say something, I mean it," the 75-year-old Egyptian said on Thursday. He added that the club had been put up for sale 22 hours after the FA's decision five months ago. Allam said that an appeal was being lodged against the name change rejection with the Court of Arbitration for Sport. "We stated earlier this year that the club would be for sale should our attempt to globally promote Hull Tigers as a brand name and as a playing name be blocked," he said. "As a consequence of the FA decision on 9 April, I announced on 10 April, within 22 hours, that Hull City is for sale." Allam was born in Egypt but came to England in the 1960s. He studied economics at the University of Hull and has remained in the city ever since. In 2014, the Allam family was ranked 295th in the UK on the Sunday Times Rich List with an estimated worth of £320m. Allam joined the firm Tempest Diesels as finance director in the late 1970s and later bought the company. He renamed the business, which manufactures and supplies generators, Allam Marine. Allam has broken Hull City's transfer record on four occasions since taking charge of the club in 2010, the most recent being the reported £10m paid for Uruguay striker Abel Hernandez. Allam, who took charge of the club in December 2010, was asked what he would do if a buyer could not be found and the legal appeal was dismissed. "I will give it away. Out means I'm out. Have I ever said anything and gone back on it?" he said. Allam said he and son Ehab, who is the club's acting chief executive, would remain committed to the club for the time being. "If the appeal comes first, ok, no harm done. If the sale comes first - sold," he said. He was sketchy on whether there had been interest from potential buyers and indicated he may stay on should the appeal be successful. The chairman conceded that manager Steve Bruce and his players needed stability, but pointed to his investment during the transfer window, which included the signing of Uruguay striker Abel Hernandez for a reported club record fee of £10m. Hull reached the FA Cup final last season, losing 3-2 to Arsenal after going two ahead, and finished 16th in their first season back in the Premier League following promotion from the Championship. They are ninth in the table with four points from three matches of the new 2014-15 season. Read more on Hull City: Could Assem Allam's Tigers name change benefit club?